Everyone was talking about the First World War last week. Or everyone in Britain, anyhow. I imagine there’s been less fuss on the other side of the Atlantic, because back in August 1914 America had the good sense to stay out of other people’s quarrels. But why didn’t Britain stay out of other people’s quarrels? On the face of it, the idea of Britain rushing to the support of France would be hilarious if the outcome hadn’t been so tragic. For much of the previous thousand years the two countries had been at war with each other – so why the sudden show of friendliness? To make the situation even more ludicrous, the supposed “common enemy”, Germany, was led by the eldest grandson of Queen Victoria – a member of the British Royal Family, in other words. It’s true that the British government, early on in Victoria’s reign, had agreed to defend Belgium against invasion – but who expects politicians to keep a promise? Especially after seventy years? A declaration like that is clearly intended as a deterrent – a bluff, in other words – and once the bluff has failed only a fool would imagine the country really did have an obligation to wade into someone else’s war. If Britain had followed America’s lead and remained neutral, then the result would almost certainly have been a quick victory for Germany (when did France ever win a war, for goodness’ sake?). The outcome would have been a powerful German-led, French-supported “European Union” much like the one we have today, except that it would have started a hundred years ago. I like thinking through “what-ifs” of this kind, because they highlight how some historical events were virtually inevitable, while others were the result of highly improbable accidents. In the 20th century, for example, an all-out clash between western-style Capitalism and eastern-style Communism was pretty much inevitable, as was a conflict between the Islamic world and Judeo-Christian interests in the Middle East. On the other hand, the rise of Nazi Germany wasn’t inevitable at all. If it hadn’t happened, few people would believe that such a malignantly evil regime could have existed even in the Middle Ages, let alone within living memory. The Nazis rose to power because a single paranoid individual managed to convert a whole country, defeated and humiliated after the First World War, to his own particular brand of insanity. That shouldn’t have happened. On the probability meter of history, the needle barely even flickers. And it wouldn’t have happened, if Germany had won WW1. The Nazis would never have existed, and neither would WW2. That’s not to say the 20th century would have been a time of peace, of course, but its real conflicts – the Middle East, and Communism versus Capitalism – would have flared up in the late 1920s (when they were already simmering in the “real world”) instead of in the late 1940s. Everyone has their own views when it comes to speculations of this type, and I’m sure most readers will disagree with me on all the details. But hopefully most people will agree on the main point, that such speculations are interesting and instructive. Last year I bought a whole book of such things, called What If? I found it in a science fiction bookshop – Forbidden Planet in London – but these aren’t way-out speculations by science fiction authors. The book’s subtitle is “The World’s Foremost Military Historians Imagine What Might Have Been”. While I’m on the subject of books you might like to read, I should of course mention a small ebook of my own – The Deadliest Weapons of World War 1 . That’s just one of a number of titles from Bretwalda Books to mark the centenary of WW1. Another ebook, with a more Fortean theme, is Myths and Mysteries of the First World War , also available as a paperback in the UK. The accompanying images show a couple of postcards I bought at an antiques fair a few years ago. 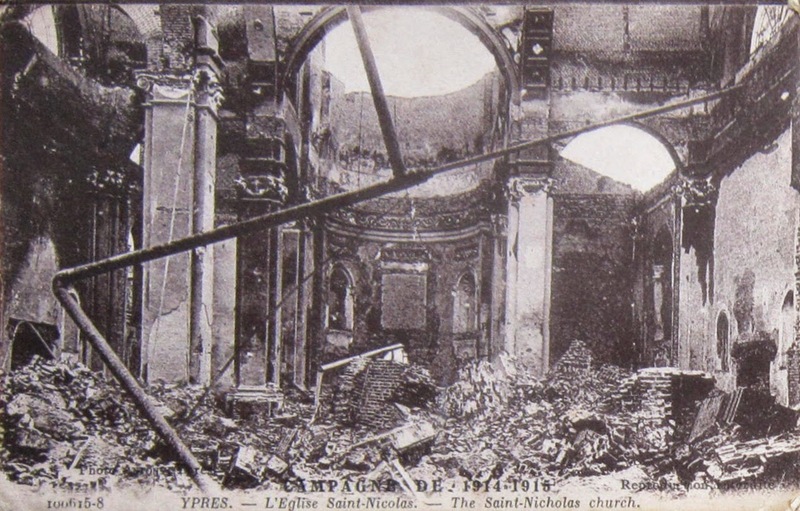 The one at the top depicts the ruins of a church in Ypres (“Campaign of 1914-1915”), which struck me as a peculiarly depressing subject for a postcard. 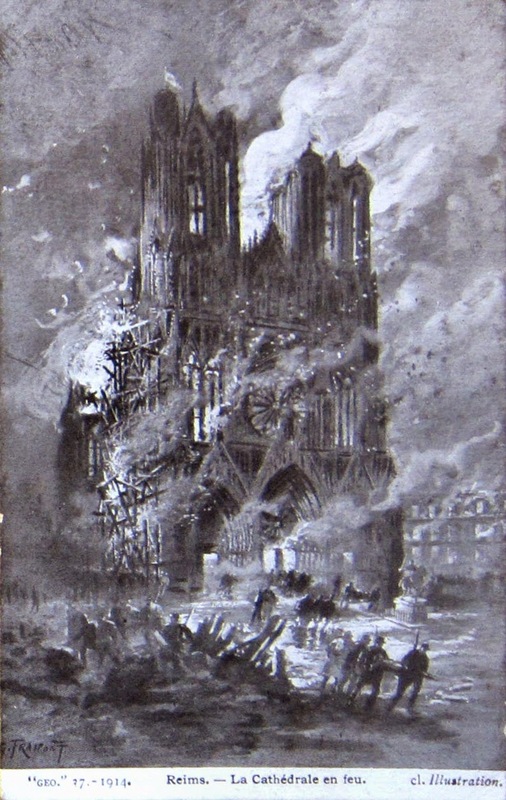 The card below is a copy of a painting showing Reims Cathedral in flames, after it was hit by German shells in September 1914. Altogether I got five old postcards for £2 (the other three depict the ruins of Caen after the Normandy invasion of 1944). Interestingly, there was a minor local celebrity named Paul Atterbury rummaging through the same boxes of cards at the same time! Yes, I've also wondered why it would have been such a big deal if Germany had won the First World War - and anyway, as a supporter of the EU I've got no problems with a German-led Europe. Germany is a much more equal society that never went for all that neo-liberal Thatcherite claptrap. Thanks Colin - good point. I think a lot of people get confused by subsequent events (the rise of the Nazi Party - which was a reaction against the German regime that fought WW1) into assuming Germany was a dangerous monster that had to be destroyed. But the monster didn't exist until we helped to create it with the Treaty of Versailles. What do you mean, when did France ever win a war? France used to win all the wars! Ever hear of Napoleon? I knew it wouldn't be long before someone picked me up on that one (I should have used a stopwatch!). You're right, of course, although most people in Britain have an exaggerated view of how often France lost its battles (and of how often Britain won its battles, for that matter). I was parodying the jingoistic view to emphasize just how ridiculous it was for Britain to leap to the defence of France in 1914 (when France neither requested it or believed they needed it - another point people often forget). Yes Kid, and it's even funnier if you get the punchline right! I guess you meant to say "Who cares who wins?" Speaking for myself, I've specialised in getting the punchlines of jokes wrong ever since I was in junior school. Oh, I see - I get it now!